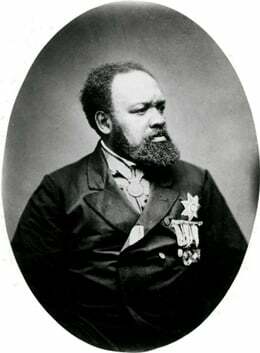 Born on July 24, 1807, in New York City, Ira Frederick Aldridge was the son of Lurona and Daniel Aldridge. The young Aldridge attended the African Free School and, in the early 1820s, began his acting career during his teens with the African Grove Theatre, also known as the African Theatre. Feeling that America wasn't a hospitable place for a black actor, however, he decided to seek his fortune elsewhere. Emigrating to England as a fellow actor's valet, Aldridge was able to find more creative opportunities, albeit with significant challenges. In 1825, Aldridge had a starring role as Oroonoko in The Revolt of Surinam in the Coburg Theatre. This fine performance, however, failed to launch a career for him on the London stage, with the actor facing racist rhetoric in the papers. Aldridge ended up spending years touring the United Kingdom, playing the title role in such Shakespearean works as Othello, Macbeth and Richard III. A well-regarded actor, Aldridge was called the "African Roscius," after the legendary Roman actor Quintus Roscius Gallus. Aldridge returned to London to play Othello in 1833 when he was only 26 years old, taking over the role for famed actor Edmund Kean, who had recently passed away. Returning to regional theater, Aldridge continued to perform Shakespeare's works. Some of his performances included samplings from several plays, and he was known for portraying white characters. In 1852, Aldridge went on his first European tour. There he earned great acclaim for his performances. Five years later, Aldridge took the stage in St. Petersburg, Russia in a series of well-received shows. He spent little time in England, launching his last major tour of the United Kingdom in 1859. Aldridge continued to act until the end of his life, earning a number of honors such as Switzerland's White Cross. He also staunchly spoke out against slavery, contributing financially to abolitionist causes and incorporating songs of freedom into his performances. Ira Aldridge died on August, 1867 in Lodz, Poland while touring.